Central location. Cute pool. Excellent shower with plenty of hot water. Hosts separated beds so we could each have our own. Free chairs for a day at Cocoa Beach Club. The first breakfast was already waiting for us in the fridge upon arrival. Lovely surprise! Nice quiet location. Loved the small bungalow with separate bedroom and bathroom. Bed and shower were excellent. Liked the air conditioner in the bedroom and fan in living room. Small kitchen, but sufficient with stove and oven to cook breakfast or other meals. Nice touch of owners to provide small breakfast for first day after arrival. Clean facilities with pool towels. Walking distance to a few restaurants. The owners Raymond and Cinderella are wonderful and very helpful with any questions and reply to emails very quickly. Would definitely stay here again. It was very quiet and peaceful. The hosts were amazing and spent so much time helping us plan our time on the island. Intimate small resort. Quiet surroundings. Nice spacious rooms. Good quality bed. Very friendly and helpful owners - Raymond and Cinderella, who organised our pick-up, car hire, diving and other things. Really relaxing place with two very helpfull and friendly hosts! We will definitely try to come back! The property is amazing! Cinderella and Raymond are always avalaible to help. We were in Bonaire to dive, they help booking our dives with Wannadive. The hosts are the most lovely and welcoming couple! Beautiful park at perfect location (near Coco beach, nice restaurants nearby) and with all comfort required. Studio was nice and modern with private veranda as perfect spot for breakfast. 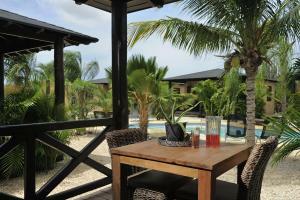 Lock in a great price for Bridanda Apartments Bonaire – rated 9.4 by recent guests! One of our best sellers in Kralendijk! Featuring a natural pool, free WiFi and air conditioning, Bridanda Apartments Bonaire is located in Kralendijk. Free private parking is available on site. All units include a seating and dining area. There is also a kitchen, equipped with an oven, refrigerator and stovetop. There is a private bathroom with a shower in every unit. Bed linen is provided. Bridanda Apartments Bonaire also includes a hot tub and barbecue. Guests can enjoy a drink at the on-site bar. Flamingo Airport is 2.5 mi away. Guests have within walking distance the beach, shops, restaurants and diving schools. 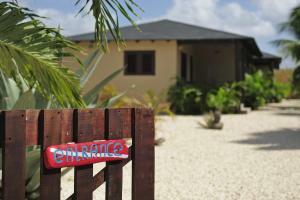 When would you like to stay at Bridanda Apartments Bonaire? The studio has a modern bathroom with toilet, sink and walk-in rain shower, a living and sleeping area with an open kitchen adjacent to a covered wooden porch. The studio’s are connected two by two, built mirrored with sufficient privacy. The one bedroom bungalow has a spacious bedroom, a modern private bathroom with toilet, sink and walk-in rain shower and a living room with open kitchen adjacent to a covered wooden porch. The two bedroom bungalow has two spacious bedrooms, a modern bathroom with toilet, double sink and walk-in rain shower and a living room with open kitchen adjacent to a covered wooden porch. 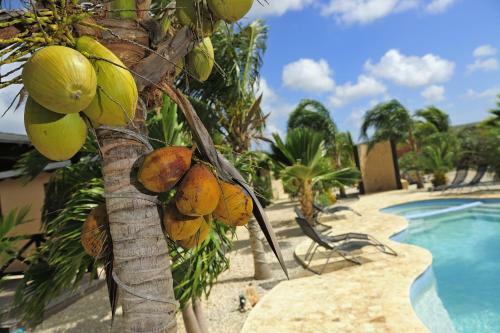 At Bridanda Apartments, on the ‘dushi’ island Bonaire, you can enjoy relaxing, intimate ambiance in a luxury studio or bungalow located in a lush tropical garden. 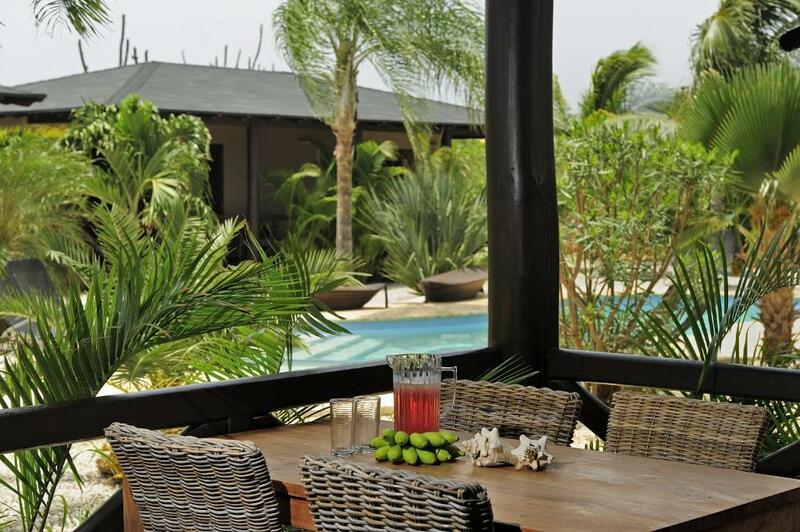 The tropical garden has a natural (non-chloride) pool, outdoor shower, Jacuzzi and sun beds as well as a bar and lounge area where you can relax and enjoy. Also rinsing bins and storage for diving/snorkelling or (kite)surf gear are available. The studios and bungalows are fully equipped and each has their own spacious porch. Our resort is within walking distance from the beach, restaurants, dive schools and dive sites, shops, bank (with ATM), tennis courts, fitness center and is conveniently located close to downtown Kralendijk. We will gladly be of assistance with tips on the best dive sites, fun activities, excursions and delicious restaurants. Our resort is within walking distance of the beach and sea with the cozy beach club "Coco Beach" where you as a guest of BRIDANDA can make free use of the luxurious sunbeds. 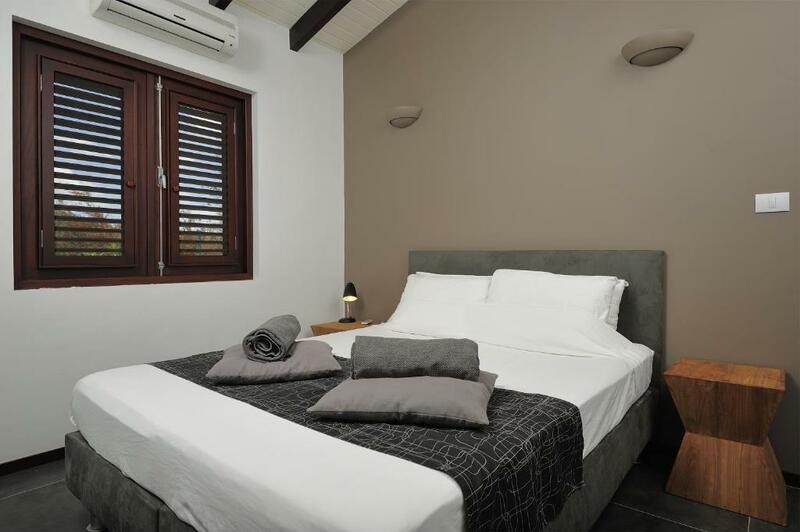 In addition, there are several restaurants, diving schools and dive sites, shops, bank (with ATM), tennis courts and fitness and very conveniently located to the center of Kralendijk. House Rules Bridanda Apartments Bonaire takes special requests – add in the next step! ATM card Bridanda Apartments Bonaire accepts these cards and reserves the right to temporarily hold an amount prior to arrival. Bridanda Apartments Bonaire accepts these cards and reserves the right to temporarily hold an amount prior to arrival. 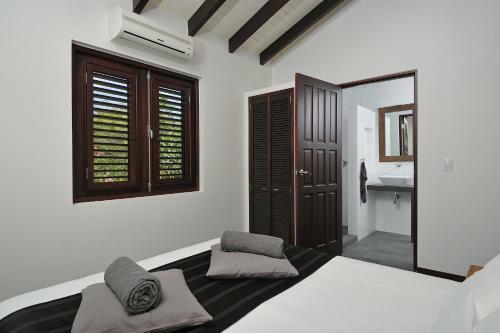 Please inform Bridanda Apartments Bonaire of your expected arrival time in advance. You can use the Special Requests box when booking, or contact the property directly using the contact details in your confirmation. Was not informed that you had to purchase toilet paper. No toaster or microwave. Bedrooms small with micro storage. No counter space in bathroom or any cabinet or shelves (4 women need storage). Advertised with air conditioning but it’s really online bedrooms. Not complaining, just want to better inform future renters. Cold or lukewarm shower most of the time. Although not so bad given it is 27c all the time. Very bumpy access road which is fine with a pick-up truck. No glass on windows, just screens, and a few mosquitoes always found their way into the room. The clim is only in the room, perfect for sleeping but the rest of the appartment was pretty hot. Hosts Raymond and Cinderella are welcoming, friendly and helpful. They helped us to book a very spectacular snorkeling tour, for which we are very thankful. Also the access to the beach nearby is included - it says to be premium access, which we did not check, because we travelled a lot around island and were not having a lot of time to spend on that beach, so you can stand your chance. The location is very nice - it is right in the middle of everything you need in terms of access to towns, supermarket, but also geographically it is in the middle of the island giving good access to the southern and northern parts of the island (make sure you have a Jeep/pick up if you are to go on a trip around island. And also there is an open cinema nearby (few steps away), we liked experience to watch movie under the shining moon/planets/stars and planes flying over, really special experience! 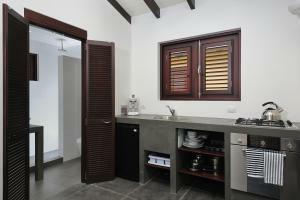 Kitchenette is fully equipped, for us it was a very important factor. Surprisingly there was no shower amenities (no soap, no shampoo, no shower gel etc. ), so be sure to have your own or buy in the supermarket nearby (like we did). Overall we enjoyed staying here. Nice welcoming and always ready to facilitate you with anything. I would always stay there again, very quiet and private.